Skin & You is a leading South Mumbai Skin Lasers & Non invasive dermatology treatment clinic. The World Class Clinic set in pristine setting is a one stop specialty skin clinic to handle all types of dermatology and aesthetic treatments. State of the Art Pain Free Laser Hair Removal, Pain Free Skin Tightening for Removal of Double Chin and Sagging skin, Non Surgical Radio frequency for removal of Acne Scars & Stretch Marks, Painless clear lift treatment for pigmentation and skin whitening. The Clinic has attracted hundreds of overseas patients worldwide, where most visit us in Mumbai, India, exclusively for Laser Hair removal and Skin Tightening RF, RF Pixel. The Skin Clinic specializes in the laser treatments to remove pigmentation and Chemical Peels from UK & Australia / New Zealand. Dr. Geeta Mehra Fazalbhoy was 1st to introduce Micro Current Non Invasive Technology for instant results and the 1st to introduce World’s leading Technology Pain Free Radio Frequency skin tightening for removal of Sagging Skin and Double Chin & Pain free RF Pixel technology for Stretch Mark removal and acne scars removal. 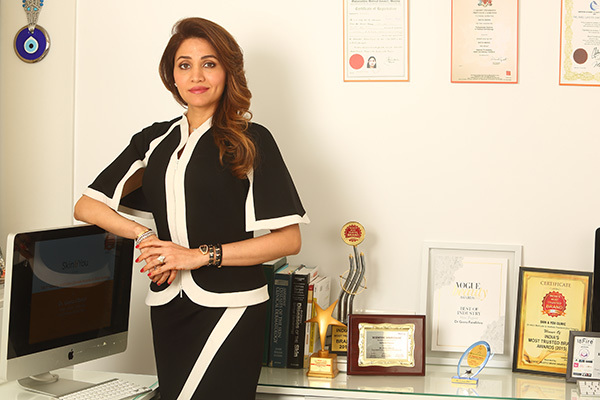 Dr. Geeta Mehra Fazalbhoy has also introduced the revolutionary I-Lipo and accent ultra for Body Contouring, Body -Shaping & Cellulite removal which is pain free & Non invasive. Results are visible in few sessions. At Dr. Geeta Mehra Fazalbhoy’s Skin & You Clinic also specializes in dermatology skin conditions like Skin & Facial Redness (Rosacea), Eczema/Dermatitis, Psoriasis, Itching, Hypertrophic Scars/ Keloids, Seborrheic Dermatitis, Fungal Infections, Nail Problems, Hair Problems, Excessive Sweating, Pigmentation changes, Melasma/ Chloasma, Acne, Acne Scarring. International training at ( Malaysia ) under MICHEL E. DELUNE , MD California. (An International Authority in Anti Aging on Botox , Fillers, Chemical Peels & Mesotherapy ). Dr. Delune has done his private fellowship with Dr. Obagi , USA. Indian Association of Cosmetic Laser Surgeons.